Eye Examination | Visionary Eyecare's Blog: "The Eye Journal"
Join Us THIS WEEKEND – Fri, Sat and Sun – Nov 13th, 14th and 15th for our Patient Appreication Event and the Lenscrafters Customer Appreciation Event. We will be giving raffle tickets to EVERYONE who comes in for an eye examination during the event. One lucky person who gets an eye exam with the lucky raffle ticket will win a FREE IPod!!! 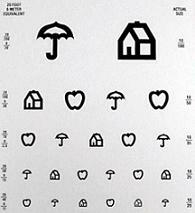 If it has been more than 12 months since you have seen an Eye Doctor….then NOW is the time to get your eyes examined!! Many eye diseases – like glaucoma, retinal detachments, retinal tears, eye tumors etc – do not cause symptoms so, it is very important to get your eyes examined yearly. 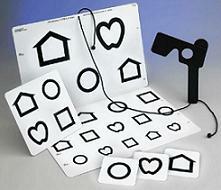 Come in to see an Optometrist here at Visionary Eyecare this weekend – and you may win a FREE IPod! 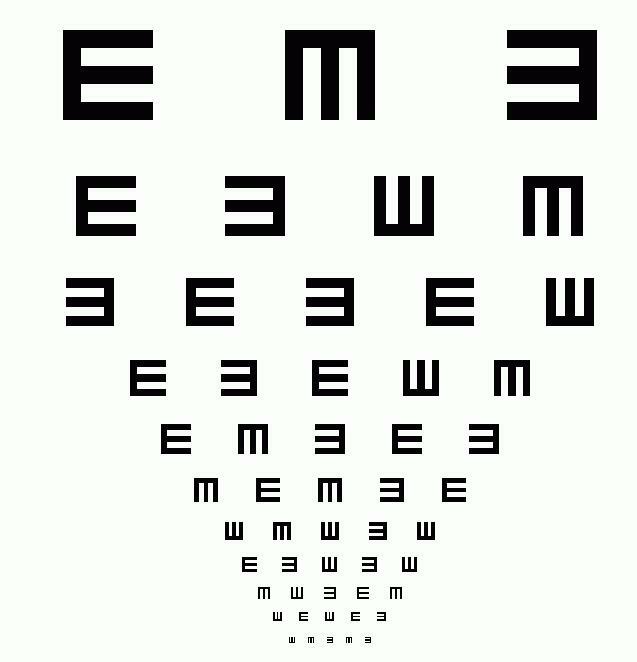 To schedule an eye exam online – CLICK HERE !! Or call us at 954-851-9949 to schedule your eye exam at our Sunrise / Sawgrass Mills Mall location for this special event. LensCrafters will be giving away FREE Designer Eyeglasses and FREE Designer Sunglasses all weekend. They will also be offering 60% OFF of their lenses with the purchase of a frame. And right now – they are also running a GREAT clearance event – with 50% OFF select complete pairs of frames and lenses – see store for details. 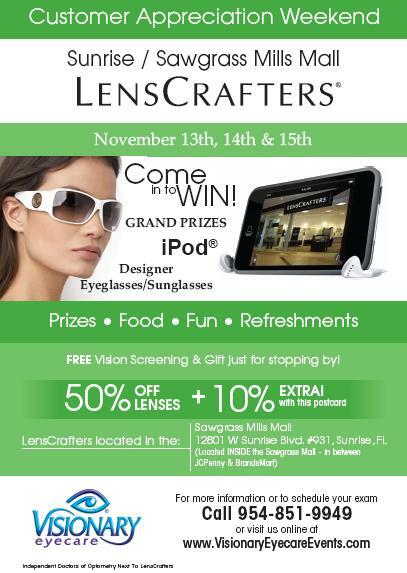 EVERYONE who comes into the Sawgrass Mills LensCrafters during the event will also be given a FREE GIFT – just for stopping by! There will also be FREE food, FREE refreshments and also FREE vision screenings during the Patient and Customer Appreication event – THIS WEEKEND – Nov 13, 14, 15 2009. We are located INSIDE the Sawgrass Mills Mall – in between JCPenny and BrandSmart. Susan Scott is a local artist and patient of Dr Dawn Bearden at Visionary Eyecare (The Indepenedent Doctor of Optometry Next to Lenscrafters) in Pembroke Pines. She had previously always had a problem finding an eye doctor who could address all of her creative and artistic visual needs. One day she was having problems doing an art project and her friend, Evelyn (who is an artist and a patient of Dr Bearden) recommended that Susan go to see Dr Dawn Bearden. 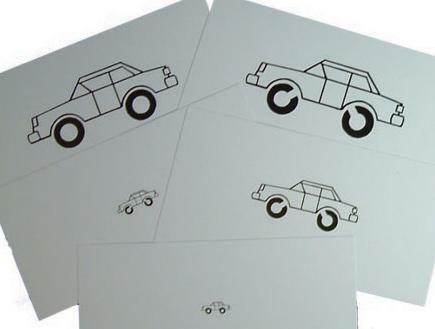 While Susan and Evelyn were doing an art project together – Susan had THREE pairs of glasses in front of her and still seemed to be having difficulty seeing what she was doing. None of the glasses seemed to meet her artistic visual needs. She felt that she just could not find an Eye Doctor that could give her a prescription that would allow her to see clearly enough to create her art. Susan recently moved to Washington, DC – BUT, she still plans yearly trips to South Florida so she can come to Visionary Eyecare and see Dr Dawn Bearden for her annual eye exam. Starlene Carter came into Visionary Eyecare (Next to Lenscrafters) in Pembroke Pines in January 2001. She was in the area and decided to stop in to schedule an eye examination for herself the following week. 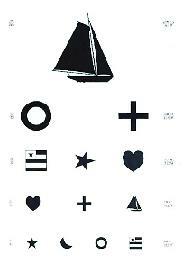 She was not intending to get an eye exam that day – her plans were to spend that day shopping! Our Office Manager, Carol Marsh, was there that day and convinced Starlene to go ahead and get her eye exam that same day since the office was not busy and the Doctor (Dr Dawn Bearden) would be able to see her right away. Starlene agreed but, was insistent that she would NOT have her pupils dilated that day. Her shopping was waiting and she did not want to “mess up her day” with that “dilation thing”. Carol told her that the Doctor would talk to her during the exam about the importance of dilation. Still Starlene would just not be convinced…. When Starlene met Dr Bearden for the first time – Dr Bearden began to explain and stress the importance of pupillary dilation. Dr Bearden explained that this was Starlene’s first eye exam in our Visionary Eyecare office, there could be a multitude of eye diseases or problems that Starlene may be unaware of (because most eye problems do NOT cause any symptoms like blurry vision, headache, eye pain etc) and that Dr Bearden may NOT be able to detect these issues if Starlene did not allow the Doctor to dilate her pupils. Dr Bearden also explained that Florida laws requires your Optometrist to dilate your pupils on the initial eye exam when you have an eye exam with a new Optometrist. Reluctantly…..VERY reluctantly….Starlene finally agreed. Erik Nunez is a South Florida resident and was a patient of Dr Dawn Bearden a few years ago in the Pembroke Pines office. When he was due for his last eye exam he just happened to be out of the country and visiting his family in Argentina. Erik had his eye examination from an eye doctor in Argentina and was never able to see out of his glasses very well. He returned to Dr Bearden to “get fixed” and here is his video testimonial (also available on our Visionary Eyecare YouTube Channel).